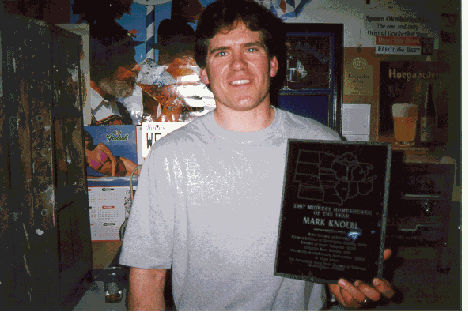 Congratulations to Mark Knoebl of Mt. Horeb, WI, 1997 Midwest Homebrewer of the Year! Mark has been brewing beer for around 10 years and has about 175 batches under his belt. His first few years were all extract brewing. He took the jump into all-grain brewing in March 1991, after coming home from a trip to Germany. Dave Norton of Nort's Worts (Kenosha, WI) got him set up with all of the right equipment. His early all-grain brews utilized a 10 gallon stainless steel pot, 2 plastic buckets-one with a false bottom, an immersion wort chiller and other accessories (carboys, tubes, etc). Every year he likes to incorporate new techniques and equipment into the mix. For example, a few years ago he started using large chest freezer for lagering. A Roller Mill replaced his Corona mill, and a counter-flow wort chiller replaced his immersion chiller. During the past year, Mark switched over to converted kegs for the boiling vessel and lauter tun. With the larger vessels he has now started brewing some 10 gallon batches. Mark is mostly a "lager man" - a minority in the field of home brewing. He brews what he likes: German style beers such as Pilseners, Exports, Bocks, Fests and Weizens. As time has gone by, he has expanded his horizons and brewed stouts and pale ales. He recently brewed a Belgian style Wit that took the best of show at the Kenosha Bidal Society Contest in April. Mark had a plan for winning MWHBOY starting in late 1996. He started brewing as many different styles as possible and planned to enter several beers in each of the participating contests. The lagers were easy, but he had some learning to do in order to successfully brew some of the classic styles such as Porter, Brown Ale, Barley Wine, Bitter, and IPA. Mark won ribbons during the course of the year for Pilsener, Weizen, Bock, Dunkel, Alt, Mild, IPA, Porter and Pale Ale, and Wit. The results in each competition, as Mark explains, were rather unpredictable. "Some brews that I thought were only okay did very well, while some beers that I thought were great didn't do much. It's always funny when others try the beers before they're entered and recommend not entering them. I always do anyway and later they often come back winning. Go figure!" Good knowledge and understanding of style is very important. Having a good homebrew shop supplier is crucial. Access to high quality ingredients is important. Responding well to critiques and learning from that criticism is also very important. You want to make your beer better and can't take well meaning criticism personally. Having a good support network, i.e., wife, family, friends and homebrew club. My wife Debbie is my biggest supporter and one of the reasons I won. I also learned a great deal from my two homebrew clubs, Headhunters and Urban Knaves of Grain. Mark has begun working at J.T. Whitneys Brewpub in Madison and hopes to continue to learn more about brewing in a brewery environment. With his obvious brewing talent and thirst for knowledge, Mark is a natural for the jump to commercial brewing. Congratulations and best of luck to you, Mark!